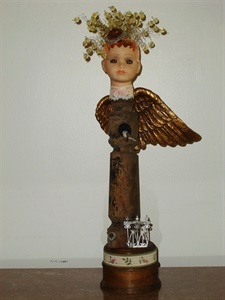 I love to find unusual items at garage sales, antique malls, auctions, and thrift stores which can be repurposed as an art work. 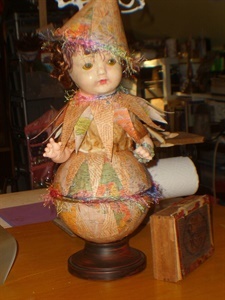 It is a challenge to take the item and create a whimsical piece. 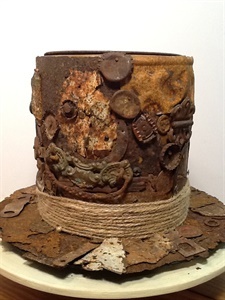 Lincoln's top hat made from found rust with a twine headband. Named Best in Show for the 2014 Backyard Sculpture Competition at the Prairie Art Alliance and Best in Show for the Chatham Library Art Show 2015. 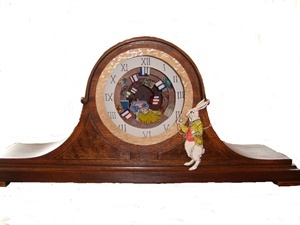 This wooden mantel clock had no workings so I turned it into the rabbit hole which Alice fell through to Wonderland. She is passing the shelves full of books and objects as she falls. This barbershop quartet looks snazzy in their matching striped vests and purple bow ties. They are singing "My Wild Irish Asparagus". This shows the entire clock. The violin was in pieces when I found it. I glued some of it back together, collaged music on the inside, and painted it with bronze metallic paint. It is standing on a bow. 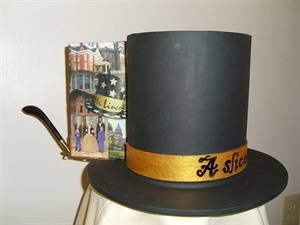 The top hat image is a familiar one in Springfield. I turned it into a cake with images of local tourist sites on the slice on the server. This violin is a musical version of the Storyteller figures of the Southwest. 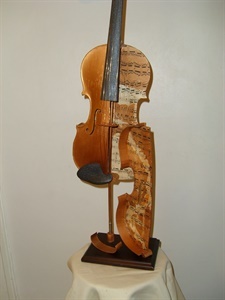 The full-sized violin has 9 small violins that it is playing music for. 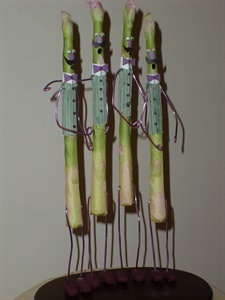 The smallest is in a cradle-board and wrapped in music themed fabric. 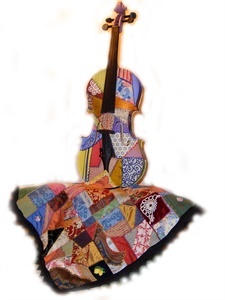 This violin is merging with the crazy quilted fabric. 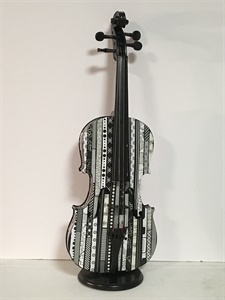 The designs on the violin are painted or collaged to copy and blend with the fabric designs. This is a full sized violin. This cake is iced with glass tiles, porcelain flowers, and fabric paint. 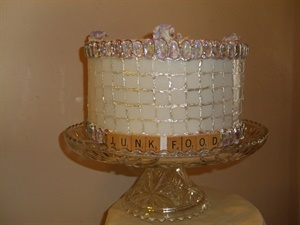 The front says "Junk Food"; turn it around to see a collage of reality television shows "for the mind." The back side of "Junk Food. . . "
In the 1950s we were told to eat our vegetables, children in China were starving. Superman was on televison--our hero. 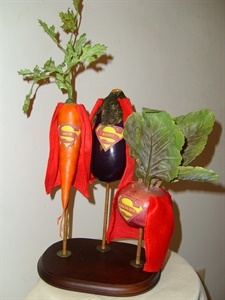 Today our economy is based on China--so my veggies are mounted on chopsticks and Chinese coins. This little bird had 8 balls on his head, so I painted them like the Magic 8 Ball. I put popular questions on his tail, the 8-ball answers around the base, and added a spinner. Ask a question and spin for the answer. 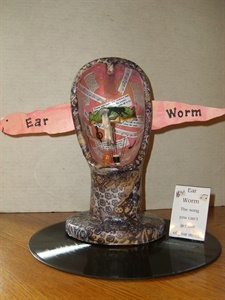 An ear worm is a song that you cannot get out of your mind. This ear worm is "Round and round the Mulberry bush." 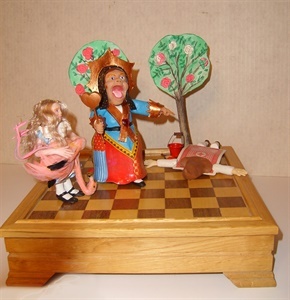 The inside of the head is filled with images of the song and the monkey can chase the weasel as you spin the bush. The base is a record. 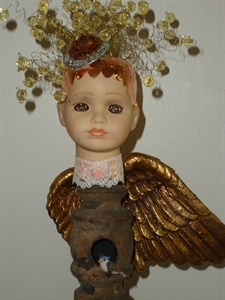 I used bronze roses for the eyes in this head which inspired the theme of the piece. The garden has a fence, more roses, and a bird nesting in the pillar. You can see the rose eyes better in this close-up. Notice her rose "fasinator" hat. The wired beads could be hair, halo, or blessings being showered. 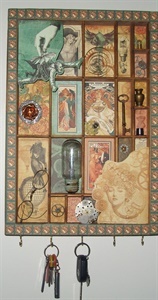 The Steampunk key holder not only uses Steampunk images, but has incorportated 3D items to match the theme. It could be used to hang necklaces as well. This was created for a challenge on the Loving Mixed Media website. 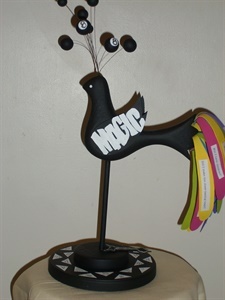 Participants had to create a shrine from a sardine can. 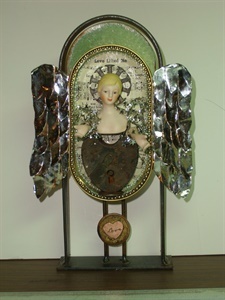 Mine became an angel showing love from the heart shaped lock to the song collaged in the back "Love Lifted Me." 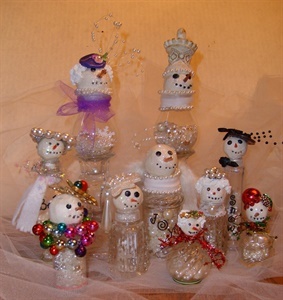 The snow people are made from a variety of old bottles which are filled with pearls and glittery items. Each one is unique--hats, scarves, and embellishments are all different. Sizes vary depending on the bottle used. Violet is one of my clarinet cuties--actually made from a clarinet. When I saw the broken clarinet I did not know what I would do with it. After mulling it over for some time, I thought of the Jazz Age. A time when music was hot, the clarinet was sending out a siren’s song which brought music lovers in droves to the clubs. This was a time of cloche hats, long necklaces, and a new sophistication for women. My clarinet figure is created from a clarinet, polymer clay, Apoxy-Sculpt, and jewelry findings. The Red Queen is demanding that the gardener be punished for planting white roses (and painting them red). Alice, struggling with the flamingo, is concerned about the croquet game. 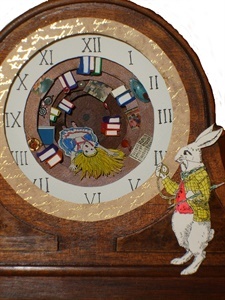 I found a vintage Alice in Wonderland book in an antique store, illustrated the main characters, and popped them up on wires coming out of the cover. 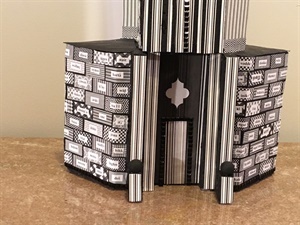 The book can still be opened and read. It has been 46 years and one of the biggest regrets voiced by people in Springfield is that the Orpheum Theater was torn down. It was a grand building which housed a ballroom and pool hall, as well as the theater. 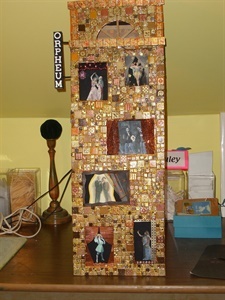 My rendition of the Orpheum shows vaudeville acts (note Bing, Jack, and George) on its stages. The exterior is covered with glass tiles on which I have embossed designs with metallic powders and grouted the tiles with gold glitter glue. Esmerelda sees all, knows all. She has a magic crystal ball which shows the future. 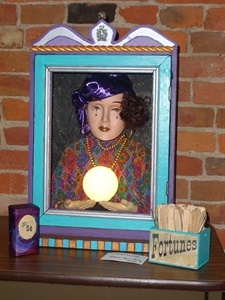 This asseblage includes fortunes which sell for a nickel. The reader's skirt is a complete book with folded pages. The backdrop is the cover of an Atlas. The first lines of novels are swirling around the reader; their titles and authors are on the base around her skirt. 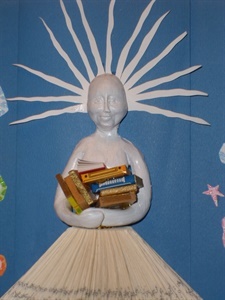 She is holding an armful of miniature books. Lucy is a world traveler and has her passport in her suitcase. Her body is covered with maps and her shape is rather globe-like. 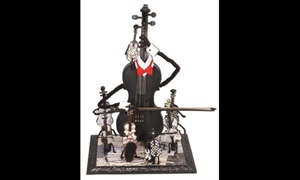 Violin collaged with black and white papers. Donated to the fund raiser for the Youth Symphony. Detail of the bottom of the tower. The Tower of Babel was a symbol of man's attempt to make a name for himself by reaching Heaven. God put an end to man's attempt by destroying the tower; creating many languages so man could not understand each other; and scattering men throughout the world. 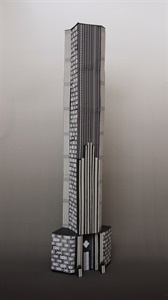 My Tower is depicted as an Art Deco Skyscraper. Each brick on the tower has the word for "one" in a different language or dialect.